When an Antarctic minke whale lost his way, people decided they had to do something to help him. In the waters around Port Lincoln, Australia, the whale had already beached himself three times in the shallow waters during low tide. As schoolchildren gathered around and watched, local man Andrew Veimulen took off his shoes and socks. He'd decided to go out and help. "It didn't seem all that fussed by me," Veimulen told local news ABC Open, "so I just came up and gave it a bit of a gentle nudge with my hands and gave it a little bit of a talking to, I suppose, and said 'Hey little mate, do you want to go back into the ocean?' and then it kind of did." "All I really did was give it a bit of a nudge in the right direction and away he — or she — went." "What if it beaches itself again?" the voice of Brett Cooper, who filmed the act of kindness, can be heard saying over the video. If that happens, we hope he always has a kind person nearby to help him find his way. 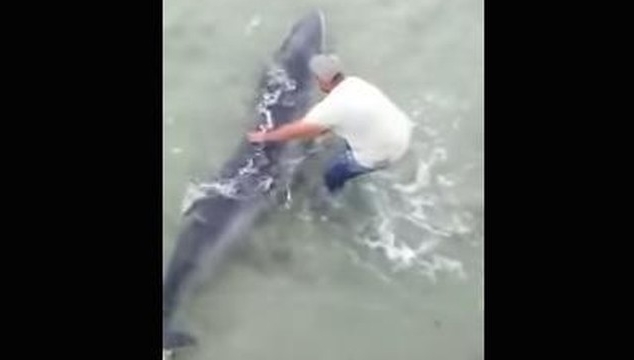 Responses to "Man Wades Out To Help Confused Whale Back To Sea (Video)"
Could have been frightened by sharks.